We are so excited to be featuring Alena Steen and get to know her a little deeper through her beautiful work in the community. 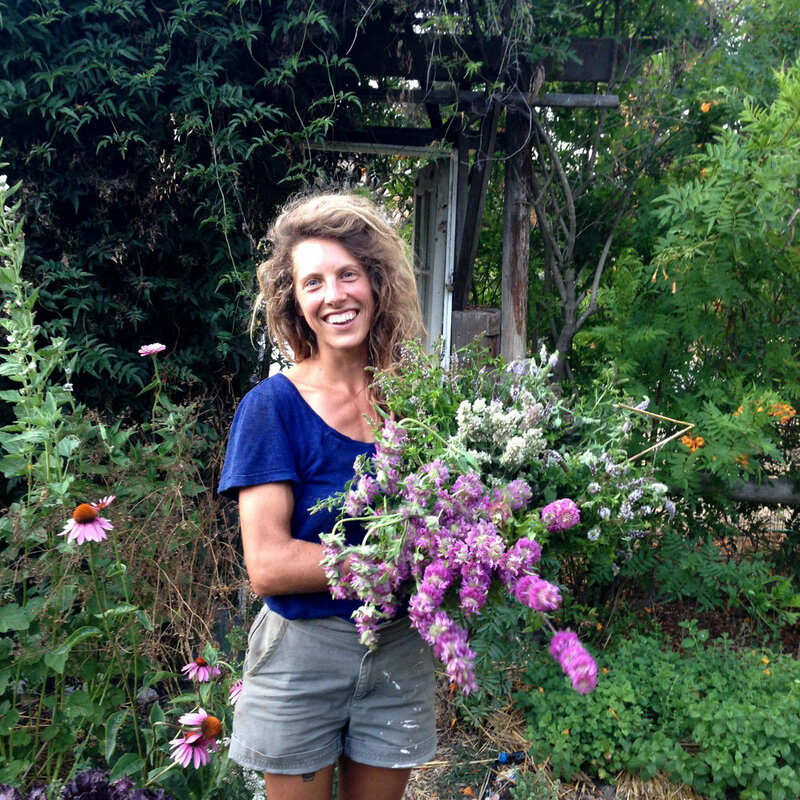 Alena is a women who has her hands deep in the soil, whether it be bringing the community together down at our local garden, or creating herbal goods from the plants she's harvested! There is so much magic under the surface of Alena and the goods she is creating, as well as her workshops and offerings she is bringing to Carpinteria! You can find Alenas creations from Earth Tide Botanicals here at our local Heritage Store! She creates everything from cold tender to mood balancer and everything in between. What led you to herbs, plants, and the garden? I first started working with plants while I was a student at a public university in my home state of North Carolina. I got a job as a gardener at the university’s native plant botanical garden and quickly realized that I absolutely loved working with my hands and body, growing plants and being an active participant in the seasons. From there, I became involved with a community garden and an organization dedicated to using the university’s purchasing power to support local farmers, and became friends with several local growers, one of whom offered me a job. So I started working part-time on an organic farm while still in college, and became full-time when I graduated. Since then, I have worked for more than a decade as an organic farmer and gardener. While I started out working mostly with vegetables and flowers, my connection to native plants and ethnobotany led to a growing interest in medicinal plants. I left my home and farm work in NC a few years ago to travel and explore the country, and ended up in the desert Southwest working with an amazing herbalist who grew up with the Hopi and Dine of northern Arizona. Phyllis and the desert taught me so much about honoring spiritual and emotional connection to plants and landscapes. I was inspired to learn even more about herbalism, and applied for an internship at a medicinal herb farm/school in southern OR. This is where I met my partner, who is from Santa Barbara, and since then we have lived along the CA coast, growing medicinal plants and learning from them. Have you always had this connection with the land? I have always felt very connected to the other-than-human world. Even as a kid growing up in the suburbs in the South, I would roam all about and find hidden corners filled with wild weeds (and eat them!). My grandmother lives on an island along the Northeast coast and I would spend summers with her, where I had free reign all through the woods around her house. All of my earliest memories are connected to plants and the forests and waterways of my home landscapes. As an adult, I have been re-learning this magical, more empathic connection to nature. From working in the community gardens, to creating herbal goods, can you share with us what you are currently offering? I also work with my partner to grow a dense organic garden on the mountain-side we call home. We grow medicinal plants and create homemade, botanically-infused vinegars, honeys, oxymels, and tinctures through a product line called Earth Tide Botanicals. We are also offering an herbal CSA from our garden this season, which will be a box of homegrown, small-batch herbal products shipped or delivered locally every other month from late March to November. This is a way for us to expand our garden and the plants that we grow, while exploring seasonality and creativity. We have a web site with our products and CSA registration: www.earthtidebotanicals.com, and are so grateful to be sharing some of this line through Heritage! Are there certain things that are inspiring you these days? I am always so renewed by the wild landscapes around my house, and sneak away all the time to walk from my garden up the mountain through the oaks and into the high and exposed ridgelines of the chaparral. Where we live is surrounded by the burn scars of last winter’s Thomas Fire, and I am fascinated by the lush re-growth of the fire-following plants, which has led to learning more about the history of this landscape, and in particular the wilderness-burning of the Chumash, the original human inhabitants of these mountains. I am also obsessed with geology, and what it tells us of deep time. This is actually where the name Earth Tide comes from—earth tides are the movement of the earth’s crust up and down each day in tune with lunar and solar cycles. I love remembering this constant, unconscious movement beneath our feet. The more I learn about the other-than-human world, the more grounded and connected I feel. At the end of each day, how do you bring yourself home? Do you have a bookends to your day? The best days end with being cosy at home with my partner and sweet old lady dog. I treasure evenings cooking food and drinking herbal tea and reading and writing.